HSBC would move up to 1,000 staff from London to Paris if the UK left the single market, following Britain's vote to leave the EU, the BBC understands. The staff who would be relocated would be those who already process payments made in euros for HSBC in Canary Wharf. Thursday's referendum result means the UK will need to renegotiate its trade relationship with the European Union - including whether it remains part of the single market. Chris Cummings, chief executive of financial lobby group TheCityUK, said it was focused on securing continued access to the single market and warned of the risk of "prolonged uncertainty" while a new relationship with the EU was negotiated. Eurozone leaders have warned that without unrestricted access to the EU, London's big finance firms could move operations outside the UK. The head of the Eurogroup of finance ministers, Jeroen Dijsselbloem, said limited access to the single market would be the "price" of the UK leaving the EU. If the UK was not in the single market or the European Economic Area (EEA), it would mean the loss of "passporting", which allows banks to operate without restriction in all EEA countries. The EEA comprises the 28 members of the EU, plus Iceland, Liechtenstein and Norway. EEA rules allow those non-EU countries to be part of the EU's single market, as long as they allow full freedom of movement of people. The head of France's central bank, Francois Villeroy de Galhau, also warned that London's banks would lose their "financial passport" outside the single market or EEA. 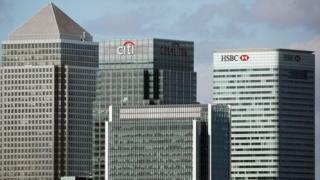 John Cryan, chief executive of Deutsche Bank, said he thought London would lose some of its status as a financial hub. "The financial centre won't die, but it will get weaker," he told German business newspaper Handelsblatt. Mr Cryan did not comment on the possible impact of the leave decision on Deutsche Bank, which employs at least 11,000 staff in the UK. Meanwhile, sources at Standard Chartered told the BBC it was unlikely that the Asia-focused bank would move any staff from London. Leave campaigners have dismissed concerns of widespread job losses, saying Britain should focus on developing trade relationships with non-EU countries. Gerard Lyons, a UK economist who backed the Leave camp, said London would not be displaced as Europe's financial centre. "We have the depth of skills, knowledge and experience that's hard to replicate," said Mr Lyons, an economic advisor to Boris Johnson. Passporting for finance firms is a "negotiable issue" with the EU, he said, particularly as several European banks also use those rules to access the UK. HSBC already has more than 10,000 staff working in Paris. The London-based bank has about 48,000 UK workers across its retail and investment banking operations. A year ago, it said it was planning to cut 8,000 jobs in the UK to reduce costs. Earlier this year, the bank said it would keep its global headquarters in London, following a review. On Friday, sources told the BBC that up to 2,000 jobs at the US investment bank Morgan Stanley could be moved from London to Dublin or Frankfurt. Morgan Stanley denied that jobs will be moved. Banks and other financial companies can be authorised to do business in one member state of the EU, or the slightly wider European Economic Area (EEA), and then ply their trade across the region without having to be separately authorised in each country. The EEA is a grouping made up of the EU, plus Norway, Iceland and Liechtenstein who have access to the EU's single market. A bank using this system can provide services by offering them from its home base to a customer in another country, or it can establish a branch abroad. It is widely used by financial firms (not just banks) in the EU. It is also used by companies from outside the EEA, such as Switzerland and the US. They establish themselves in one place in the EU, typically in London as the continent's dominant financial centre, and use that as their headquarters for selling services across the single market. If the banking passport is no longer available to British-based firms, then some operations would clearly have to shift to a location inside the EEA. What is impossible to judge is just how much business, and how many jobs, would be affected. Would any shift be narrowly focussed on those functions serving EEA customers? Or would firms find it more cost effective to move other parts of the business as well? Read Andrew's full analysis on passporting. What is an EU 'bank passport'? EU referendum: Is Britain ready for Brexit? Could UK be forced into quick EU exit?